Though they certainly aren’t for everyone, netbooks have proven to be a popular category between consumers since their introduction almost a decade ago; all thanks to their portability and low price. But it’s been a while now since another product came to threaten netbooks’ spot in the market: the tablet. Touchscreen-only devices are the norm today, and that’s why the PC industry has adopted this philosophy as well. The laptop we’re looking at here is a result of that compromise. It’s a netbook that’s also a convertible, which means that it can easily double as a standard tablet thanks to its small size and the presence of the touchscreen-friendly Windows 10. It sports an Intel Pentium processor, 4 GB of RAM and a 500GB hard drive. 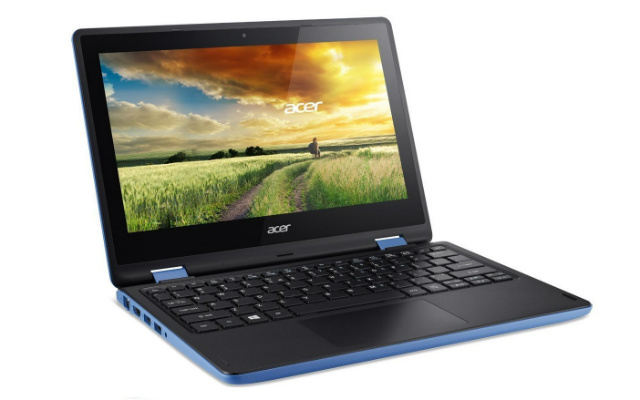 Check the review of the Acer Aspire R 11 R3-131T-P344 below to see if this is the computer for you. The first thing to note is that this laptop features the standard screen size for almost all netbooks. We’re dealing with an 11.6 inch touch panel that effectively classifies the Aspire as a small laptop and a slightly bigger tablet at the same time, which defines the versatility of the product. The resolution sticks to a 1366x768 configuration, certainly not the highest available but the usual for the price and the type of machine. Also, as is usual with netbooks, the laptop goes for a more colorful design than more robust machines. The inside body, including the keyboard, is all black; but the outside goes for a more playful blue with a matte-finish. It’s worth noting that the keyboard is not backlit, but at this price point the feature is hardly expected. Power isn’t one of the biggest selling points for netbooks, but thanks to the big leaps we’ve experienced with processors, each year they are getting better and better. In this case, we’re looking at a quad-core Intel Pentium N3700 clocked at 1.6 GHz from the Braswell generation. This is a small chip especially designed for the smallest of laptops, and as such offers low energy consumption for more durability and lighter bodies. Because of that, the Aspire performs well in simple tasks like web browsing, office work and watching videos (be it YouTube or Netflix); but it’ll struggle with more demanding software like editing high definition video, so its use should be limited to the former. Multitasking is not on the higher side either with its 4 GB DDR3L SDRAM configuration. The thing is, besides it being a standard setting in this category, 4GB of RAM sound more than adequate when you consider this machine also acts as tablet hybrid. In other words, you’ll handle comfortably tabs in your browser and a couple of programs running at the same time, but expect a bit of reloading in heavier sessions. As stated above, this laptop is not made for power users, and that includes gamers. We are definitively looking at integrated graphics, for starters, and though the Braswell generation improved GPU performance, you’re still limited. Modern 3D games are definitely not an option, but if you stick to simple indie and classic titles you should be fine. The short version? Not made for gaming. You might not be able to do gaming, but you can bet this laptop will last you without charging. Acer claims up to 8 hours of battery life thanks to the 4-cell Li-Ion (3220 mAh) battery present; though it’s usually healthier to expect a bit less —in this case, let’s go with 7h. On intense sessions like videos playing non-stop, you shouldn’t drop much more than 5h, and that’s a completely fine result. On the review of the Aspire R 11 R3-131T-P344, connectivity is surprisingly better than expected. We start with the standard USB ports (two of them, 2.0 and 3.0 each) and the ever present audio and microphone jack, but the presence of HDMI and Ethernet is what really stands out, as most of these machines don’t tend to have those useful options. Storage is a bit trickier. We’ll looking at a 500 GB hard drive, which is plenty of space for most people, but the slow 5400RPM speed will disappoint some. The good news here is that the hard drive is easily swappable, so those looking for better performance do have an option. After reading through the review of the Acer Aspire R 11 R3-131T-P344, we can come to the conclusion that it qualifies as a compelling convertible. It has the internals of a standard netbook and, thanks to the versatility of Windows 10, it can comfortably act a tablet or even a desk screen. The expanded connectivity especially makes it a useful machine to have, but in general it’s a solid performer for what it tries to do. Looking for small laptop and a neat tablet? This will probably do both of those with good results.